GSG Expo Updates: Mattress manufacturing IS a part of the "new economy"
Mattress manufacturing IS a part of the "new economy"
That's the recent conclusion from the US National Academy of Engineering. They went on to explain in a recent statement that new data technology and digital advances formerly reserved for "new economy" tech industries are transforming traditional manufacturing sectors. This is no new revelation for Global Systems Group (GSG), but it's nice to see this concept reinforced by this respected organization. Cloud computing, data collection and analytics, as well as wireless technologies are being used by GSG to meet mattress manufacturers' needs for greater throughput and more flexible production methods. 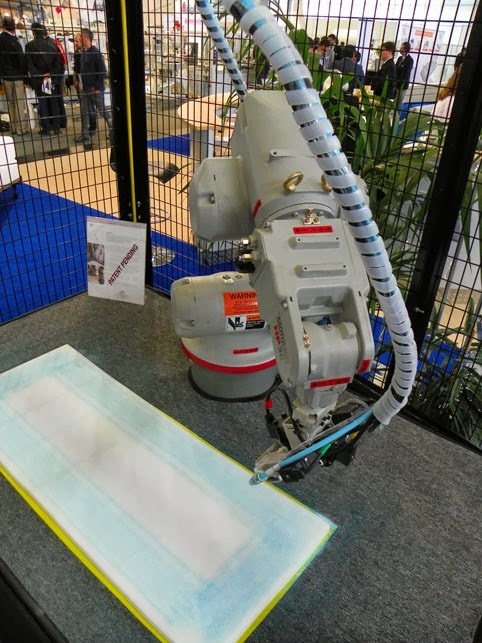 In 2013, we shared this mattress factory robot at Interzum, and we'll be demonstrating this again in May. More importantly we be showcasing much more automation and wireless data products that can eliminate waste in time and labor, and improve your production efficiencies. Whether you think your mattress business is part of the "new economy" or "old economy," it's going to take innovative technology to make progress moving forward. Visit GSG at Interzum to see the latest innovations that can impact your business.